At the beginning of the twentieth century, bankruptcies averaged fewer than 20,000 per year. Even in 1935, at the height of the Great Depression, bankruptcy filings in federal court climbed only to 69,000. At the end of World War II, in 1945, they stood at 13,000. From 1950 on, the statistics show a steep increase. During the decade before the 1978 changes, bankruptcy filings in court averaged 181,000 a year—reaching a high of 254,000 in 1975. They soared to over 450,000 filings per year in the 1980s and mostly maintained that pace until just before the 2005 law took effect (see Figure 13.1 "US Bankruptcies, 1980–2009"). The 2005 act—preceded by “massive lobbying largely by banks and credit card companies”CCH Bankruptcy Reform Act Briefing, “Bankruptcy Abuse Prevention and Consumer Protection Act of 2005,” April 2005, http://www.cch.com/bankruptcy/bankruptcy_04-21.pdf.—was intended by its promoters to restore personal responsibility and integrity in the bankruptcy system. The law’s critics said it was simply a way for the credit card industry to extract more money from consumers before their debts were wiped away. The BAPCPA provides for six different kinds of bankruptcy proceedings. Each is covered by its own chapter in the act and is usually referred to by its chapter number (see Figure 13.2 "Bankruptcy Options"). Chapter 13, Adjustment of debts of an individual with regular income: applies only to individuals (no corporations or partnerships) with debt not exceeding about $1.3 million.11 United States Code, Section 109(e). This chapter permits an individual with regular income to establish a repayment plan, usually either a composition (an agreement among creditors, discussed in Section 13.5 "Alternatives to Bankruptcy", “Alternatives to Bankruptcy”) or an extension (a stretch-out of the time for paying the entire debt). Once a petition in bankruptcy is filed, the court issues an order of reliefThe court’s order determining the debtor’s property to be under the control of the bankruptcy court., which determines that the debtor’s property is subject to bankruptcy court control and creates the stay. The Chapter 7 case may be dismissed by the court if, after a notice and hearing, it finds that among other things (e.g., delay, nonpayment of required bankruptcy fees), the debts are primarily consumer debts and the debtor could pay them off—that’s the 2005 act’s famous “means test,” discussed in Section 13.3 "Chapter 7 Liquidation". First, secured creditors get their security interests before anyone else is satisfied, because the security interest is not part of the property that the trustee is entitled to bring into the estate. This is why being a secured creditor is important (as discussed in Chapter 11 "Secured Transactions and Suretyship" and Chapter 12 "Mortgages and Nonconsensual Liens"). To the extent that secured creditors have claims in excess of their collateral, they are considered unsecured or general creditors and are lumped in with general creditors of the appropriate class. Third through sixth (after secured creditors and priority claimants), other claimants are attended to, but not immediately. The bankruptcy code (perhaps somewhat awkwardly) deals with who gets paid when in more than one place. Chapter 5 sets out priority claims as just noted; that order applies to all bankruptcies. Chapter 7, dealing with liquidation (as opposed to Chapter 11 and Chapter 13, wherein the debtor pays most of her debt), then lists the order of distribution. Section 726 of 11 United States Code provides: “Distribution of property of the estate. (1) First, in payment of claims of the kind specified in, and in the order specified in section 507…” (again, the priority of claims just set out). 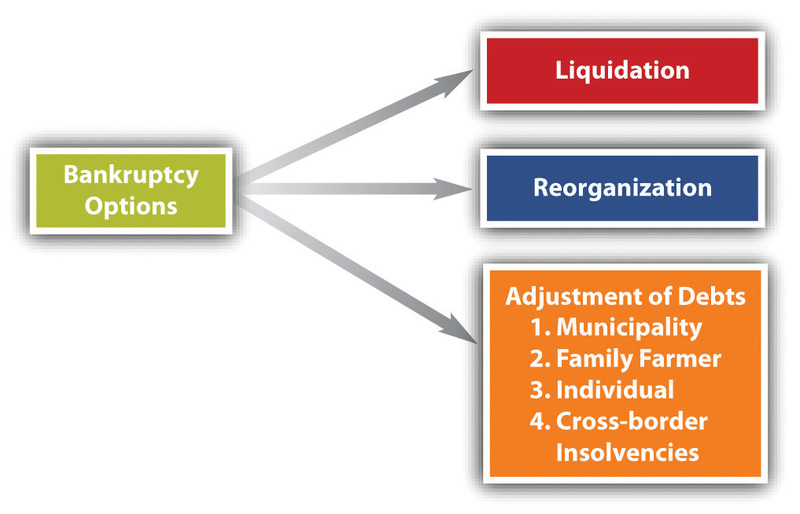 Following the order specified in the bankruptcy code, our discussion of the order of distribution is taken up in Section 13.3 "Chapter 7 Liquidation". This is not an exhaustive list, and as noted in Section 13.3 "Chapter 7 Liquidation", there are some circumstances in which it is not just certain debts that aren’t dischargeable: sometimes a discharge is denied entirely.